the tutelage of an acarologist. Expert assistance is necessary for identifications of soil mites to genus or species. By combining slide mounts with examination of specimens in alcohol, reasonably accurate sorting of samples can be performed. Four suborders of mites occur frequently in soils: the Oribatei, the Prostigmata, the Mesostigmata, and the Astigmata. Specimens in alcohol can usually be assigned to one of these suborders. Slide mounts are required for placement of dubious specimens. Techniques for slide preparations are given in Chapter 9. Krantz (1978) provides keys to all families of the Acari. Keys to families or superfamilies of soil mites themselves may be found in Dindal (1990). As is the case for the collem-bola, taxonomic aids may be found in sites on the World Wide Web. Interactive keys have also recently become available (Walter and Proctor, 2001). The soil mites are a subset of the Acari. Occasionally, mites from other habitats are extracted from soil samples. During autumnal leaf drop in deciduous forests, foliage-inhabiting mites may enter the soil food webs and may be found in Tullgren extractions. This group includes, for example, plant-feeding mites (red spider and false spider mites) and their predators. Occasionally mites parasitic upon vertebrates may be seen in soils from the vicinity of mammal nests, or host-seeking larval forms may occur in Tullgren samples. These stragglers doubtless enter into the soil food webs. But the more numerous species are the true soil mites. Among the four mite groups, the oribatids are the characteristic mites of the soil and are usually fungivorous, detritivorous, or both. Mesostigmatid mites are nearly all predators on other small fauna, although some few species are fungivores and these may become numerous in some situations. Acarid mites are found associated with rich, decomposing nitrogen sources and are seldom abundant except in agricultural soils or stored products. The Prostigmata contains a broad diversity of mites with a variety of feeding habits and strategies. Very little is known of the niches or ecological requirements of most soil mite species, but some tantalizing information is emerging from field research (Walter et al., 1987; Hansen, 2000). As noted previously for Collembola, some mites may play significant roles as consumers of plant pathogenic fungi. In ecosystems where most primary productivity occurs below ground (e.g., grasslands), where nematode biomass is high in root rhizospheres, nematophagous arthropods (including mites) could be significant predators of plant-feeding nematodes (Gerson et al, 2003). Oribatids (Figs. 4.17-4.20) are an ancient group. They have the richest fossil record of any mite group, dating back to the Devonian period, or 350-400 million years ago (Labandeira et al., 1997). Specimens from a Devonian site near Gilboa, NY, contain organic matter visible in their guts, attesting to a long relationship between oribatid mites and decomposing vegetable matter (Norton et al., 1987). Some oribatid species are Holarctic in distribution, being widely distributed in forest floors of Europe and North America. A general catalog of oribatids of North America was published by Marshall et al. (1987). 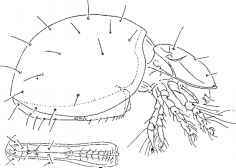 Oribatid mites occur in all terrestrial ecosystems, from arctic (Behan-Pelletier and Norton, 1983) to tropics (Balogh and Balogh, 1988, 1990; González et al., 2001) and from deciduous forest (Hansen, 2000; Lamoncha and Crossley, 1988) to desert (Santos and Whitford, 1981). A combination of three factors makes oribatid mites unique among the soil fauna. First, their sheer numbers are impressive. They are the most numerous of the microarthropods (Travé et al., 1996). Second, they often possess juvenile polymorphism. Many immature stadia do not resemble their adults. 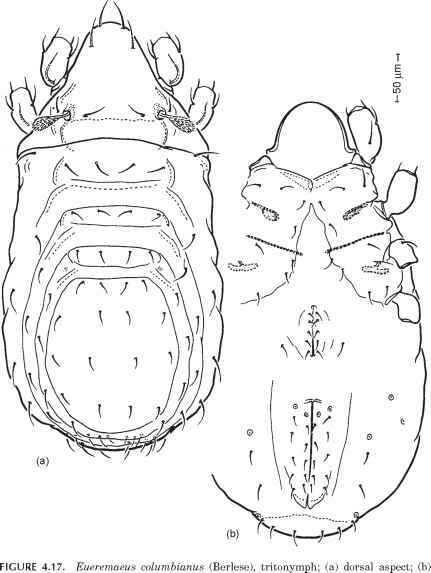 Unlike most other mites, the immatures of some of the Oribatei (the "higher" oribatids) (Norton, 1984) are morphologically so dissimilar from the adult stadia that it is frequently impossible to correlate the two based on morphology alone (compare Figs. 4.17 and 4.18). Despite the differences in morphology, immature stages and adults can usually be cultured on the same resources. Third, oribatids reproduce relatively slowly, in contrast to the other microarthropods. One or two generations per year are usual, and females do not lay many eggs. Indeed, some common species are parthenogenic. Oribatids are sometimes considered to be "K" specialists, and, in contrast, collem-bolans would be "r" specialists, or opportunistic species (MacArthur, 1972). However, orbatids' K-style traits may be a constraint of low secondary production, not an adaptation or specialization. ventral aspect (from Behan-Pelletier, 1993). FIGURE 4.18. A "box" mite of the oribatid family Phthiracaridae. For protection, the legs can be withdrawn beneath the hinged prodorsum (after Baker et al., 1958). FIGURE 4.19. Oribatid scanning electron micrograph (SEM) with calcium in exoskele-ton. (a) and (b) are micrographs of an oribatid mite (Hypochthonius sp.). A 100-|im marker is indicated at lower right. (a) Image made by secondary electrons. (b) Map of calcium distribution made from X-ray image (from Todd et al., 1974). FIGURE 4.20. 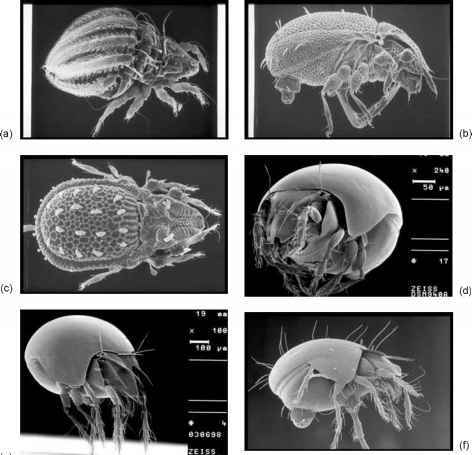 Scanning electron micrographs of oribatid mites, showing modified setae (a—f) (from Valerie Behan-Pelletier, personal communication). 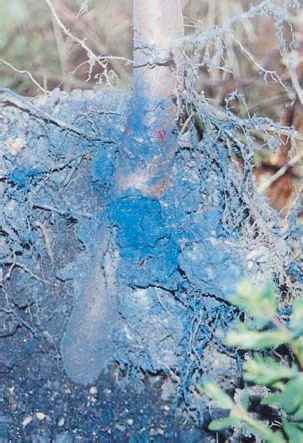 layer of the integument that may be highly sculptured (Norton et al, 1997). Oribatid densities in forest soils are in the range of 50,000-500,000 per square meter (Table 4.4). Coniferous forests typically support high numbers of oribatid mites, followed by deciduous hardwood forest, grassland, desert, and tundra. In arctic tundra and in some grassland or savanna habitats, oribatids may be outnumbered by prostigmatid mites (see later section). Cultivation of agricultural fields reduces oribatid populations to an average of about 25,000 per square meter. Population cycles in agroecosystems are often initiated by harvest and cultivation procedures, which change patterns of residue input into soils. The diversity of oribatid mite species is large in soils from many different localities. In a southern Appalachian hardwood forest, Hansen (1997) reported 170 species of adult oribatid mites from litter and soil, with as many as 40 species in a single 20-cubic-centimeter sample core through the soil profile. Many oribatid mite species are widely distributed across a variety of habitats in Europe and North America, including such common species as Oppiella nova, Tectocepheus velatus, and Scheloribates laevigatus. Tropical soils also contain a diverse community of oribatid mites. Noti et al. (2003) examined three ecosystems in a sere in the Democratic Republic of Congo and reported a total of 149 species of oribatids. They found that the number of species dropped regularly from forest to savanna, where sampling revealed 105 oribatid species. This high species diversity has caused some authors (i.e., Anderson, 1975; André et al., 2001) to consider "the enigma of the oribatids" (as a comparison with "the paradox of the plankton"), in view of the seeming uniformity of forest floor habitats. Indeed, explaining this prodigious diversity of apparently similar species with similar requirements is a long-standing question (Hansen, 2000; Bolger, 2001). Tropical and temperate forest canopies may support large numbers of oribatid mites, in such abundance that canopy-inhabiting mites have been dubbed "arboreal plankton" (Walter and Proctor, 1999). Tree canopies have long been known to support phytophagous spider mites and their mite predators (Phytoseiidae and relatives). 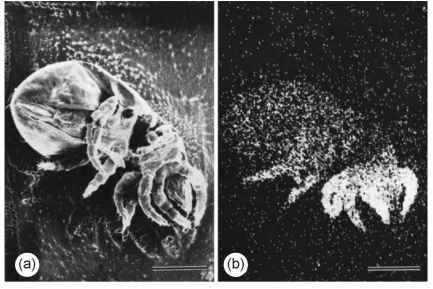 Oribatid mites in forest canopies have been ignored until recently (Winchester, 1997; Behan-Pelletier and Walter, 2000). Forest canopies contain a variety of microhabitats, most of which have been exploited by oribatids. As yet there appears to be no standardization of collection methods such as have been developed for forest floors, and density estimates are hard to come by. Behan-Pelletier and Walter (2000) suggest that canopy orib-atid species assemblages may be distinct from those of the adjacent forest floor, although some species occur in both types of habitat. Canopy oribatids exhibit some behavioral and morphological modifications suiting them to the peculiarities of that habitat. Individuals may tend to form small clusters during daytime hours, and sexual dimorphism is better developed than in forest soil species (Behan-Pelletier and Walter, 2000). Species generally have short, clubbed bothridial setae, perhaps an adaptation to the stronger air currents in the forest canopy. Gut analyses of canopy oribatids suggests that they utilize a similar broad spectrum of material as do forest floor oribatids; they appear to be primarily mycophagous but their guts include a mixture of dead vascular plant material, lichens, and fungal hyphae. Populations of oribatid mites in forest floors show peaks of activity beginning in spring and continuing through the summer months, and again in mid-autumn (for those species producing two generations per year). Peaks of abundances of immatures show a gradual progression during the summer (Fig. 4.21) (Reeves, 1967). Population densities for many species are markedly higher during these months. Is there a sequence of oribatid species—a succession—in decomposing forest leaf litter, corresponding to a succession of fungal species? Crossley and Hoglund (1962) found such a general relationship. In a detailed study, Anderson (1975) concluded that the dominant oribatid species rapidly colonized litterbags containing beech and chestnut leaf disks. The mites fed upon the succession of fungi, but no succession of the mites themselves was demonstrated. FIGURE 4.21. 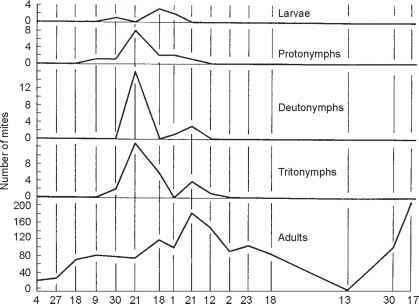 Oribatid immatures and adult abundances by season (larvae, nymphs, and adults of Oppia subpectinata [Oudemans]) (from Reeves, 1967).